Got this one as a “sample” to try and see if it was worth bringing in. The short answer was no and anyone I know that tried a beer from this brewery was in agreement. Beer pours a clear deep amber color with almost no head. Aroma was not pleasant with hints of oak and dark fruits. Taste was weak with a slightly sweet base but not much else happening . I let the beer warm hoping that would help but it did not. I finished about half the beer and the rest went down the drain. Brewers Description: Beer brewed by hand by decoction and infusion of high fermentation, unfiltered and unpasteurized with a secondary fermentation in the bottle. 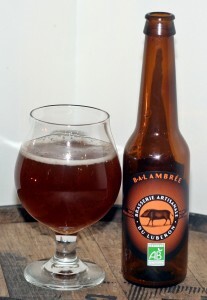 BAL is an amber beer tasting rich and spicy with a nice structure, which balanced malt flavors and alcohol.